Belgin Yücelen’s practice is primarily based in sculpture but also includes prints, video, and installation. She draws on a range of cultural and historical references. Ancient scripts, architectural patterns, traditions, social interactions as well as allusions to literature, epic stories, history, and science imbue her art. 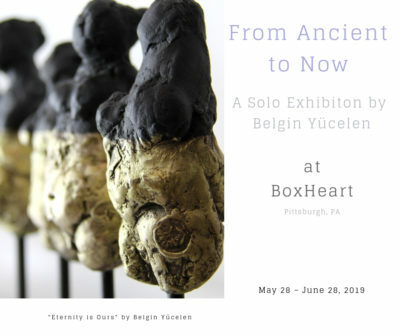 A synopsis of Yücelen’s diversified artworks, this solo exhibition at the BoxHeart gallery tells stories lost in a time between ancient and now and a place between Middle East and West. This exhibition is supported by funding from the Colorado Creative Industries and the National Endowment for the Arts.